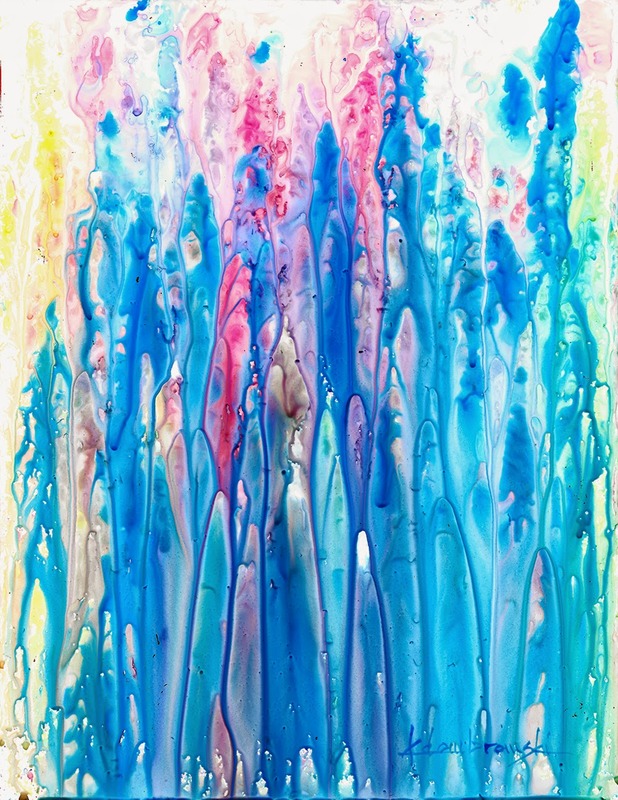 Kelly Dombrowski Art: Drippity Do Da! Day 27 of Leslie Saeta's January Challenge. Well THIS is acrylic on Yupo! Mega paint since most slides off and it really does not stay saturated when it slides off. I definitely am experimenting more with this! I got all kinds of little interesting things going on in there! Yes, lots of interesting little bits! Cool! Thanks! It reminds me of fractals! I'm a little surprised, too, Kelly. were your colors less I sense starting out? Did you use water instead of glazing medium? Wonder about golden hi-flows? Nice result, tho,...just not the one you were looking for! Highflow. It's just what happens. Oooh, LOVE the dribbly bits so much! I don't know whether you work standing but I did a workshop last summer with Bob Burridge and we stood to work for the week by which time I had a solid know in my back. A friend suggested a set of bed risers for my table and it solved the problem. I'm loving your series this year!